The 17 HMR is a relatively new rimfire cartridge that is useful for target shooting and hunting small game animals. As I have said in a previous page, it’s not the speed that kills but it is the rapid change of direction that the bullet experiences that is the killer. 17 HMR rifles will propel a 17gr bullet to 2500 ft/sec at the muzzle. A 22 Magnum rifle, for comparison, will propel a 30gr bullet to 2200 ft/sec. What is important about this is that the 17 HMR bullet is lighter and travels at a higher velocity so it will slow down faster inside the target. Put another way, it will “throw on the brakes” harder than would a lightweight 22 Magnum projectile. Regardless of bullet construction or nose type, the mass of the bullet is a dominant factor in determining the ability of a bullet to retain its velocity inside of a fluid medium. The atmosphere that surrounds us is a fluid and the blood and tissue of a game animal follows Newtonian fluid laws conceptually in terms of fluid drag slowing down a projectile. The ability of the 17 HMR projectiles to rapidly decelerate inside of the target allows for more humane shots against small animals and reduces the risk of a bullet traveling through the target and on to wound or damage something that was not intended as a target. This does not make the 17 HMR any different from any other gun—if you discharge the weapon where it is not allowed and get caught, the penalties will be the same. What I like about it is its ability to deliver massive damage to a very shallow penetration depth. 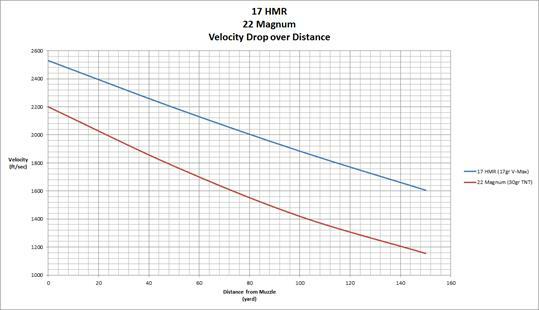 Depicted in blue, the 17 HMR still retains greater velocity than the 22 Magnum at 150 yards despite being a lighter bullet. If the 17 HMR bullet is constructed similarly to the 22 Magnum bullet, then there will be substantially more pressure acting on the bullet to initiate expansion and fragmentation. Specifically, the fluid pressure acting on the 22 Magnum bullet is 8900 PSI while the fluid pressure acting on the 17 HMR bullet will be 17,200 PSI. Copper 220, a common copper used in the construction of bullet jackets, has a yield strength of 9,600 PSI at room temperature. The die-pressing method of making bullets will work harden the copper, which will increase the pressure needed to deform that material when it hits a target. From a quick look at the numbers, it looks improbably that the 30gr 22 Magnum bullet will expand or fracture at 150 yards. The 17 HMR at 17,200 PSI will likely still expand and fragment just fine when engaging a target at 150 yards. There are other interesting possibilities with the 17 HMR, though by no means is this a suggestion that the cartridge is suitable for self-defense usage. Utilizing the CCI 20gr FMJ, the 17 HMR rifle can penetrate NIJ II-A body armor and continue on to penetrate into the neighborhood of 8” in 10% ballistic gelatin. The same cartridge can impact bare 10% ballistic gelatin, tumble inside the gelatin and penetrate past the 12.0” FBI minimum penetration depth. If you look closely, the 17 HMR rifle ballistics are slightly ’softer’ than the ballistics of the 4.6x30mm HK PDW cartridge. 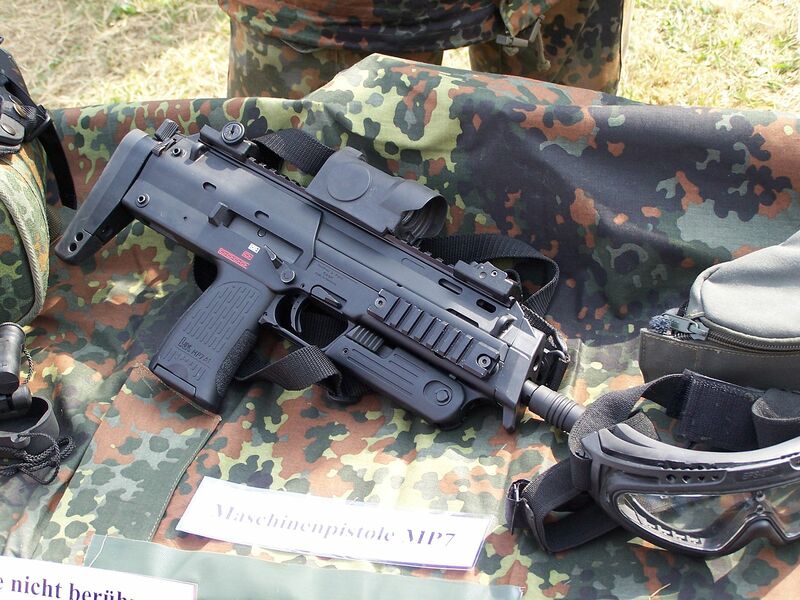 Since we can agree about the military nature of the MP7, we can agree about the nature of the intended target without being ‘untoward’ by mentioning specifics. With a kinetic energy at the muzzle equal to a 38 Special, that means to me that the 17 HMR is capable of penetrating light body armor and incapacitating an attacker with the correct ammunition. Ammunition selection for the 17 HMR is fairly straight-forward. The 17gr expanding bullet is effective out to 150 yards when shot from a rifle-length barrel. The 20gr FMJ bullet offers an interesting option if the only gun that you have is a 17 HMR and you must have a firearm for hunting food animals and for self-defense.